An essential element to gain grounds and stay upwind, help underpowered conditions, increase wave count or move count, and because it's just so classy, the FRONT LOOP!!! Oh wait... nevermind, the QUICK TACK!!! First off, I was planing on creating a how-to describing the various steps and for now thought I'd post 3-4 exemples from my last session, it's not gonna be perfect examples with a low-speed plane and 12 (8?) knot winds but it'll show how I do it in extremely light conditions. So just a reference for now. On the first one I got a planing entry and wait a bit too long before changing side, so the nose buries a little upon getting power, not a worry but not ideal especially when on a 220cm long board ! A few examples on how I use the mast to stabilize the sail and am able to quick tack in very light winds with 81L and 4.5. 1. I aim for clean swell (avoid chop and criss-crossing terrain to maximize success). 2. I guide my board with my back foot, move the sail to the back, release weight from front foot and place it in front and mostly towards the other side of the mast foot. 2a. We can cross from close-hauled to beyond the wind (in the vid, there are some variations), it's easier to switch when closer to the starting reach, the longer we wait, the harder it normally gets. 3. I climb up the swell and give the board a little jolt as to create forward momentum, and a bit before reaching the peak, still with the sail back, I step on my front foot and pull hard on the depowered sail to swap side with the sail basically. 3a. The pull is across but in a no-wind situation is almost mostly towards the nose of the board. This sends the sail directly in front of me. I aim to end with most of my weight on the back foot and body centered directly over the board. 4. Once on the other side, I may grab the mast or the boom. Grabbing the mast gives me more sail control, grabbing the boom lets me steer off the wind faster. I extend my front arm and sheet in with the back one as to steer away from the wind. 4a. The earlier we switch, the more likely we are to backwind sail for a bit. So let's grab our small board and start off practicing in light winds... Ready? You should be able to change speed in the YouTube player. May need to be in a browser, not sure it's available in mobile apps. I'd eventually like to do a tutorial vid on this. This was quick and thought it'd be worth sharing even in this format. the formal instructional guides like Trickionairy 3 suggest. Per ctuna, getting to the other side smoothly is the entire game. Everything else is "how to facilitate that". Peter Hart makes an excellent suggestion about body weight during the carved entry. As we start to carve upwind we first move the weight in over the board, then forward, which reduces tippyness. Then the hop. I too throw the rig way forward as soon as I get around if I'm not backwinded, though I learned 20 years ago to try to be backwinded. It's the most stable situation if the water is rocking. If the nose sinks, sheet out fully until it comes back up. Small boards are like bicycles; the faster you are moving the easier it is to balance. Wait for the bicycle to come to a complete stop & it is much harder to balance. If you go while the board is still moving then the nose will be in a much better position to support you weight. If you wait for the board to come to a complete stop then be prepared to navigate your exit as a U-Boat commander. With good speed & a good carve the nose will cross the eye of the wind so pop around, rake the sail forward & sail away. However, if you are losing speed then go early before the nose crosses the wind & finish the turn by back winding. The smaller the board, the lighter the wind, the more important it is for you to be able to sail back winded. Per Manuel, stand tall & do not lean over. Do not have your feet to wide before you go to the other side or you will likely end up going over the nose as you shift too much weight forward. Per ctuna front hand on the mast & rear hand on the harness lines allows you to push the sail further back & reduces power in the rig so you are less likely to lean out against the rig making it hard to step around the mast standing tall. Manuel has a unique method of bringing the back hand to the mast before taking the front hand to the other side of the boom. and it will be hard to get that to work if you are not light. When you put your front foot up to the mast put it on the far side of the mast pointing backwards (toes pointing to the tail). Gets it out of the way for when the back foot steps up and gets your body pointed in the right direction when you do bring the back foot up. Yes I like to have my toes pointing back a little. There's a feel to find the right tilt of the board and ideal foot positioning before switching sides. I find the water state more important though. My technique is meant mostly for when the switch happens out of the plane (most cases unless overpowered or have really friendly water state or a board that planes fast such as a freestyle board). If one is planing while tacking, and sails backwind for a while then the technique is different. Just like jibing is different whether planing or not. While holding the mast before switching helps lean the sail back more, it also reduces the sail pull and overall entry speed when doing it in light winds. That's why I like to stay on the boom, I can keep the drive and mast foot pressure for as long as possible. Also yanking on the boom lets me pull harder than I would if I was using the mast, actually I sometimes even lean back before pulling. This helps me send the sail farther away from me when on the other side and I obtain a wider V drawn by my body on the sail so it has more stability. Lately I have been backwind sailing while planing for a little but haven't found waterstate clean enough to make it worth while for a video. 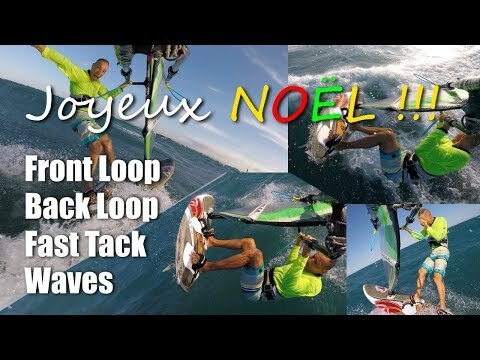 Basically, it's the same technique that one would do when going for a planing backwind jibe. EDIT: Oops, I also meant to add that there are various ways to achieve the same thing. Some things will work better on certain spots, for certain people, and with different wind speed, gear setup, etc. I thought it'd be worthwhile to share a style that I haven't seen so much (my philosophy for my blog really to show things that aren't found or hard to find).